Filmed in one night by writer-director Carson Griffin, inspired by the personal demons highlighted by his own army service, this is a devastating distillation of living with mental illness, unfolding through the visual, aural and thematic tropes of a horror film. Thunderstorms dominate, the oppressive sound design incorporates an abstract music score and the visual assault includes television static, mirrors, images of decay and the persistent appearances of a horned, horrifyingly omnipotent “demon”. Through the medium of a harrowing horror short, Griffin – and his editor wife Teri Griffin – has found an immensely disturbing way of literalising his “demons”, capturing the unrelenting horror of one woman’s unsuccessful daily battle with depression, paranoia and anxiety. Griffin has acknowledged its obvious debt to David Lynch, among others, but this superbly crafted, dialogue-free film is a distinctive and distressing piece of work in its own right. 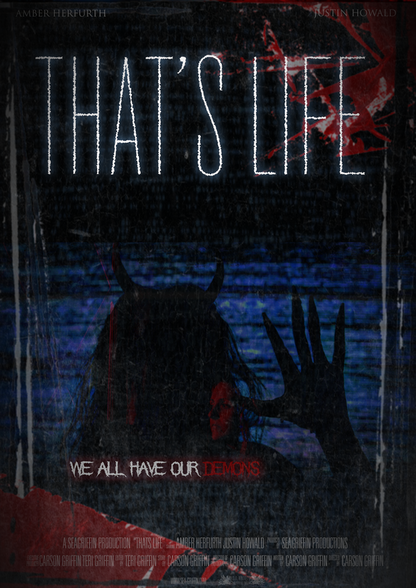 THAT'S LIFE_Sea Griffin Productions from Sea Griffin Productions on Vimeo.